One of the very best tricks I use to find information about a person in my RootsMagic family tree is to search for the person from within my Ancestry Member Tree. Today, I ran across Mary McGlynn in my tree, married to Samuel Blair Mertes. They are in the 1910, 1920 and 1940 U.S. Census residing in San Francisco, California. I only had a birth date of "About 1875" and a birth place of "California" for her from the census data. In RootsMagic, she had no WebHints on any of the four services. It was time to put my favorite Ancestry search plan into action. Yep, no Hints here. Why not? Probably because I haven't "touched" her profile ever in this tree. Whoa. Overload! How did that happen? 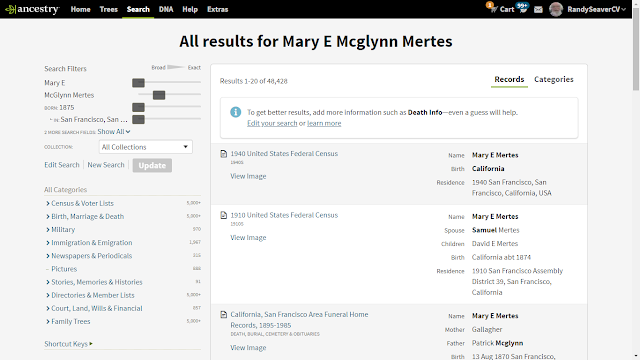 Because the way Ancestry searches, it assumes all available information is "Broad" (not exact, not ever in a range) and puts both a maiden name and a married name in the Surname field (note "McGlynn Mertes"). 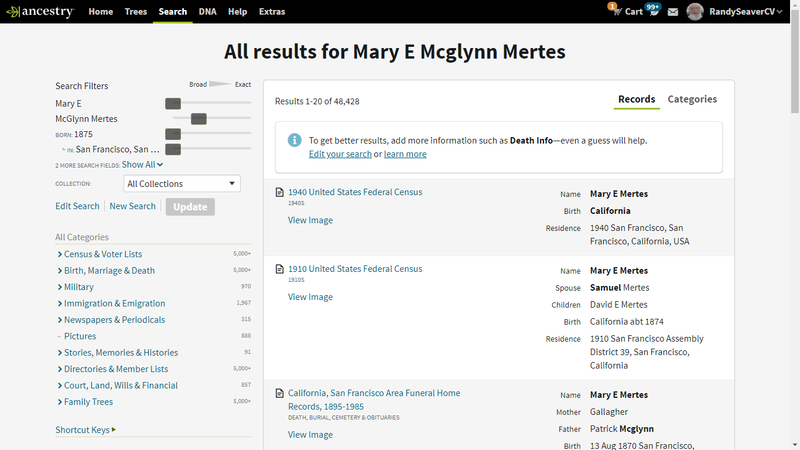 How do I know that it's the "right" Mary E. (McGlynn) Mertes? Her son D. Everitt Mertes is the informant, and he is in the 1920 U.S. Census with his parents, Samuel and Mary (McGlynn) Mertes. The newspaper death notice says she was the widow of Samuel Mertes and the mother of D. Everitt Mertes. A birth date is given for Mary in the record above, with a death date of "September 1957." 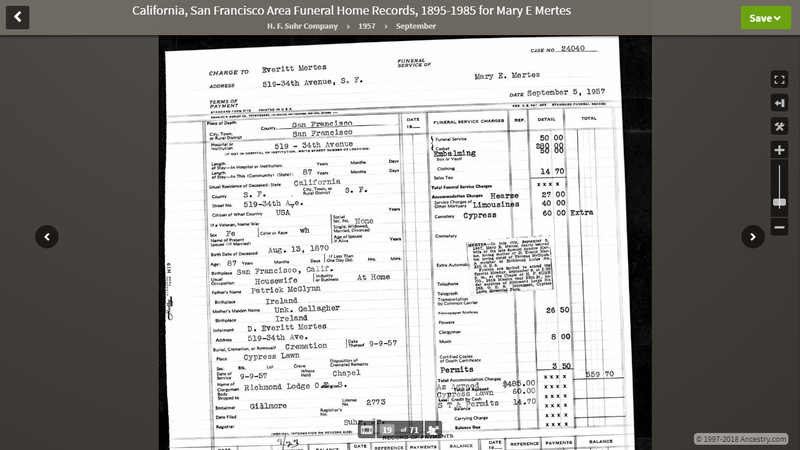 A death index record further down the match page provides the death date of 5 September 1957, which is also the date of the contract on the image above. 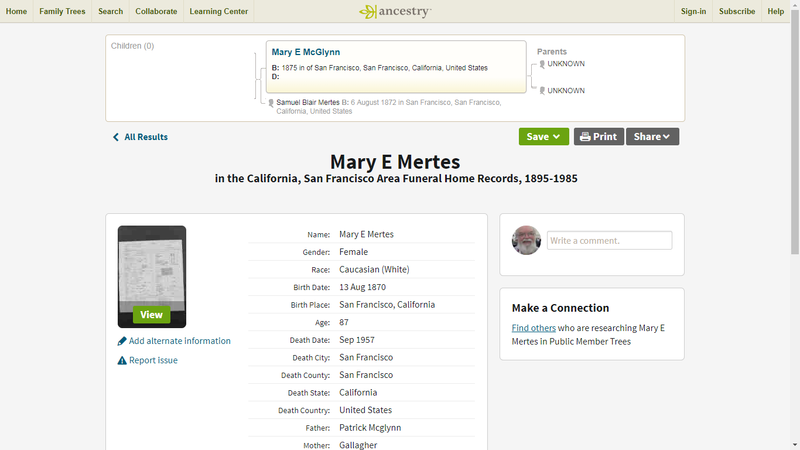 I have added the funeral home record and the death index record as sources to my profile of Mary E. McGlynn in my RootsMagic tree and will TreeShare it later tonight to update the Ancestry Member Tree profile. 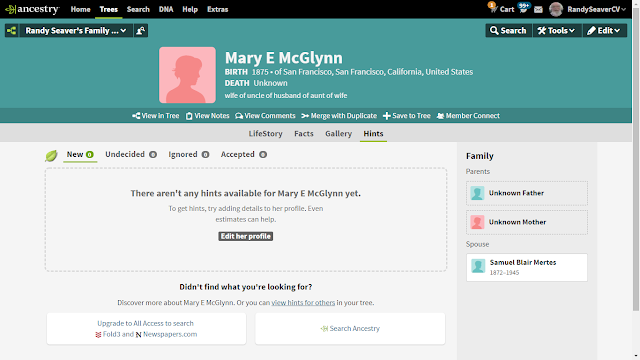 I will also update the FamilySearch Family Tree profile for Mary. Oh, the funeral service costs $60, the casket cost $280, the embalming $60, the sales tax $14.70, the hearse $27, the limousines $40, the burial $60, the newspaper notices $26.50, the music $8, the permits $3.50, for a total cost of $559.70 to the deceased's family. One more little "problem" solved - there are over 50,000 "problem children" in my RootsMagic family tree just waiting to be worked on. 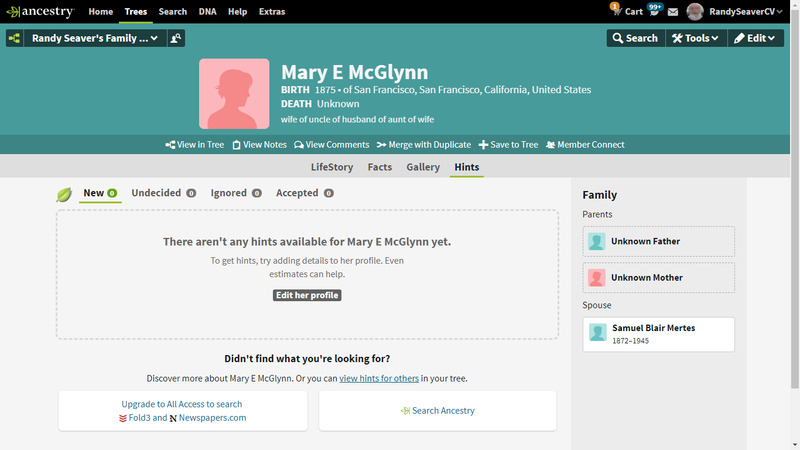 Do you search from the Ancestry Member Tree profile? You really should - because it finds more matches than just WebHints or Suggested Records. Yes, Randy, I do use the Ancestry search, all the time. I never search from within Legacy (going to various websites). I’ve always preferred the do it yourself method that you demonstrated here. I may edit the search criteria to broaden or narrow the search. This method has worked for me for many years. Thanks Rancy - sharing this post for my Aussie mates on my Facebook page.